To minimize settling, the layer of crushed rock beneath the slab was compacted prior to the pour. This view shows the author working on what will be the main floor of the house. Image Credit: All photos: David Goodyear Dampproofing the concrete frost walls with a bitumen-based sealer. Prior to the application of the sealer, the author chipped off the dollops of concrete at the ends of the form connector rods and filled remaining divots with plastic cement to prevent water intrusion. After applying beads of adhesive to the conrete the author clamped sheets of EPS insulation to the foundation wall. The adhesive reached full bonding strength in two hours. 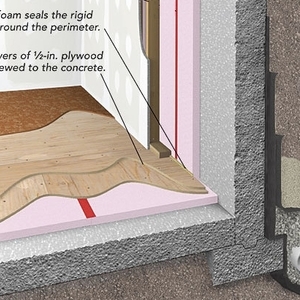 Foam creates a thermal break between the frost walls for the garage and the house. After applying adhesive to the wall on the right, the author added a 2-inch layer of EPS insulation. In 11 hours, the author managed to complete about 80% of the insulation work on the frost walls. Perimeter drains are encased in a highly permeable sock that will help prevent the line from clogging. 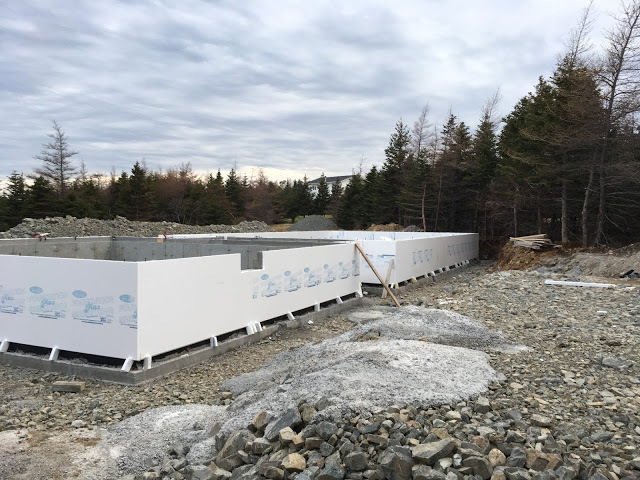 With the slab in place, Flatrock Passive is now ready for framing. Thermal bridging through foundation walls can lead to significant energy losses in any building, whether superinsulated or not. 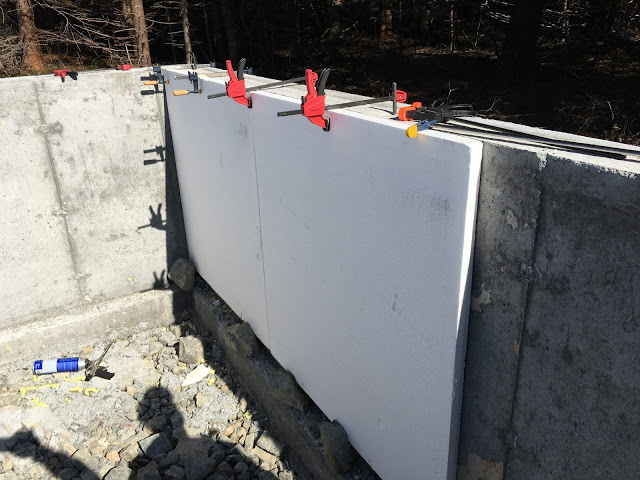 There are several options for decreasing thermal bridging through a concrete foundation, including the use of insulated concrete forms (ICFs). We decided against ICFs mainly because the footings have to be pretty level in order for the forms to be level. In a poured concrete wall, if the footings aren’t perfectly level, a reference line can be maintained inside the concrete forms by attaching 2x4s and leveling them with a transit all the way around the form. 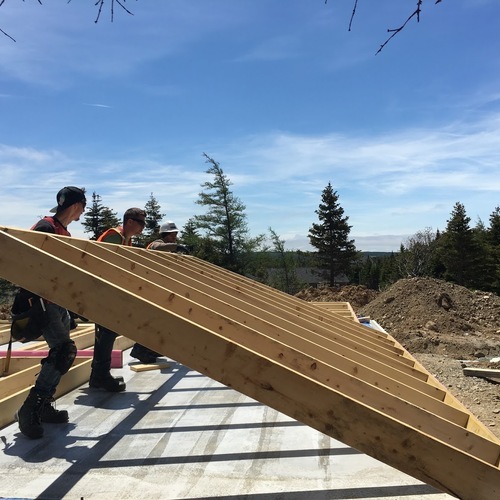 Once the concrete is poured into the form, it is brought to the bottom of the 2x4s, leaving a perfectly level wall once the forms are stripped. Since this is a common local practice, it seemed like a good place to start. Adding EPS insulation on the exterior of the foundation for the whole structure (although not necessary for the garage/porch) and the interior foundation walls for the house then created a kind of poor man’s ICF. Concrete forms are reinforced with steel straps and have clips that join adjacent panels. Interior and exterior panels are joined together with reinforcing rods that keep the panels from splaying apart once the concrete is poured. 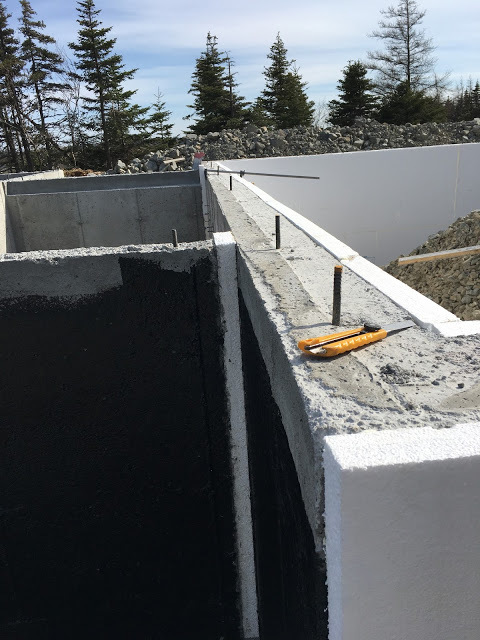 Once the forms are removed, the rods leave a steel connector protruding through the concrete as well as a knob of concrete, which gets in the way of applying exterior foam. Each steel connector can be removed with a swift blow from a hammer. However, a knob of concrete usually remains. I found that using a masonry hammer at the right angle and applying a swift blow from a framing hammer to the masonry anvil breaks it off in once piece. If not, some minor chipping is required. The concrete flies everywhere so you need to make sure that your safety glasses are on! Q&A: Insulated Garage: Insulate Below the Slab? The broken steel rod provides a way for water to enter the foundation and allow the connector to rust. These spots are typically patched this with plastic cement — a simple, cost-effective solution. There are very few local options for waterproofing or dampproofing the foundation. Around here, nobody sprays special coatings, and stick-on membranes are typically a special order, so I opted for locally available products in order to keep things simple. 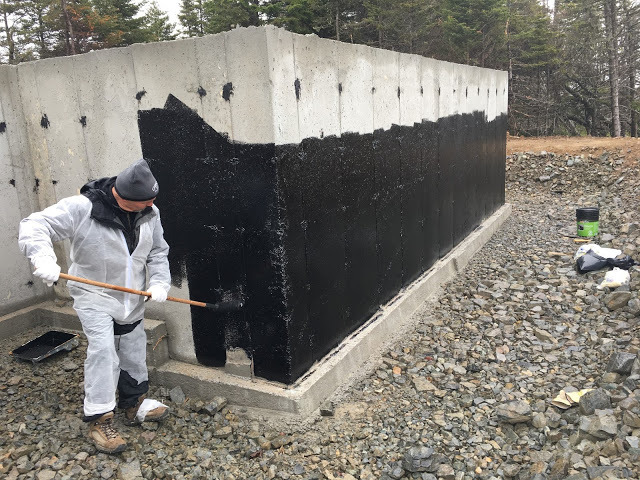 We decided to use ResistoSeal Foundation Coating (or equivalent) which is a bitumen-based sealer that hardens once the solvents evaporate (see Image #2, below). It’s hardly a green product, but it is a cost-effective option that is often used by local builders. Nobody said this stuff is fun to work with… it goes everywhere! Plans called for 2 inches of Type II EPS inboard and outboard of the house portion of the foundation. The foam on the exterior of the garage and porch was added to help with the thermal efficiency of the garage, which will be a woodworking shop I plan to use mainly in the winter. Each sheet is shiplapped and can be overlapped with the adjacent sheet. The sheets are easily cut with a small, fine-toothed handsaw after snapping a chalk line on the surface. Although there are fancy nail guns with plastic washers that would work well for attaching the foam to the concrete, rental shops around here have never heard of them…. so on to plan B! 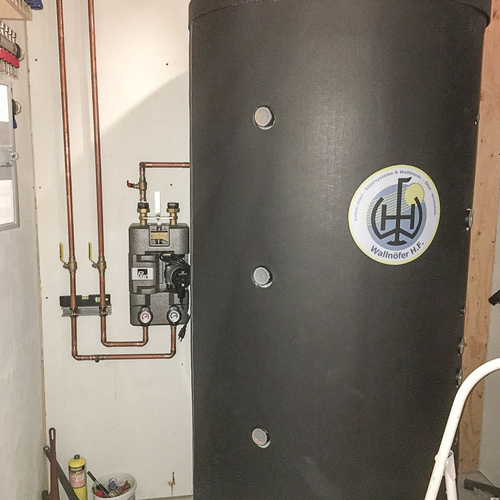 We considered using LePage PL 300 adhesive to attach the insulation, but I know from past experience it skins over quickly and doesn’t perform well at low temperatures. Instead, I opted for DOW EnerBond SF. The reusable spray foam gun can be cleaned up with acetone. The instructional information states that it gives full adhesion within 10 minutes and full bonding strength within two hours. For each sheet we sprayed lines of adhesive 5 or 6 inches long on the foundation at the high points on the wall (typically where foam sheets intersected). We leveled the foam to the top of the foundation and clamped it lightly in place (see Image #3 below). Since the wall is slightly more than 48 inches high, the foam is sitting just above the footing; enough to wedge a rock at the bottom of the foam to hold it in place. We decided against filling this small gap with foam later. The connection between the two foundations (see Image #4 below) was treated in a similar fashion. Foam was abutted into the thermal break with adhesive. After the wall is parged, it will look like a continuous foundation from the outside. This solves the thermal break issue and the foam edge being seen from the outside. After 11 hours, the foundation insulation was about 80% complete (see Image #5 below). After insulating the foundation, we immediately started work on the underground service, well water line, and the drainage tile around the foundation. Wade’s Excavating dug a 3-foot-deep trench from the utility pole to the house. Local regulations require 6 inches of sand at the bottom of the trench. The trench contains conduits for both electrical and data (cable, internet, phone, etc.). Once the conduits were installed and expansion joints added at the utility pole to account for the PVC expanding and contracting with changes in temperature, the whole trench was backfilled with another 6 inches of sand. Regulations also require 2×6 pressure-treated wood be placed in the trench — a safety measure to ensure that if anybody is digging they will presumably dig into the plank before tearing up the electrical conduit. Running the water line for the well was fairly easy. We bundled the 1 1/2-inch water line with the electrical TEC cable and the copper ground wire. It was simply wrapped with electrical tape every 3 feet and run from the well, along the footing of the house, over the electrical service, and into a 4-inch piece of ABS that was specifically placed under the footing before the footing was poured. Running the drainage tile was fairly simple as well: just uncoil and wrap around the foundation while using fairly large rocks to hold it in place. 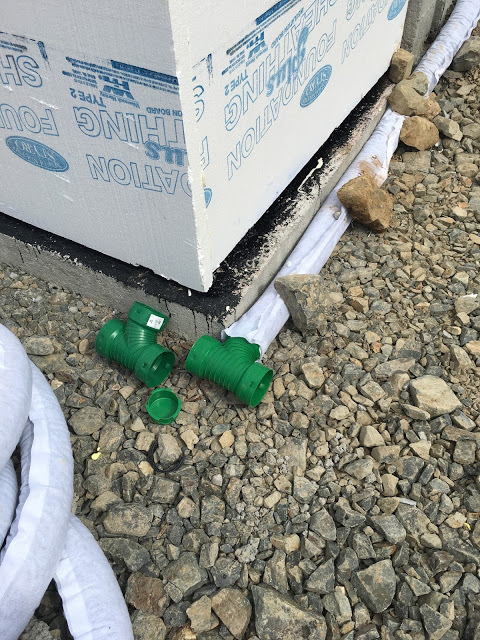 I purchased weeping tile with a highly permeable sock over the whole length that will help prevent larger pieces of sand from clogging the weep holes in the drainage pipe (see Image #6 below). At a couple of corners of the house I decided to add a couple of tee-wyes; I’ll be able to add clean-outs that will come up to ground level. Electricians came and extended the electrical conduits above ground level. There are three in total, including one for future PV panels. Recently, the local public utilities board approved net metering for the province. Details at this point are scanty, to say the least, but it made sense to install the conduit, nonetheless. With a power budget of 5 megawatts for the entire province for electrical feed in to the grid, I expect the applications will chew that up pretty quickly. I have priced an 8 kW system, which will offset all of my yearly power use. At current electrical rates, the payback is fairly long, i.e. 23 years. However, with the Muskrat Falls boondoggle we are expecting power rates to double within the next five years; .the payback then becomes 14 years. 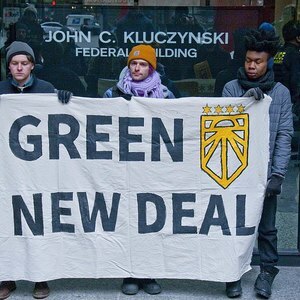 With most solar panels requiring very little maintenance, and having warranties of around 25 years, the benefit of solar looks more appealing. Lugging stone for the weeping tile was not fun. We were left to move almost 10 tons of stone by hand with two shovels and a wheelbarrow. Luckily, a friend of mine offered his services and came by with an extra shovel and a wheelbarrow. We had everything done in about 4 hours. With the weeping stone complete we covered the stone with a high-quality drainage fabric that would stand up to backfilling. At a total cost of $72, it’s pretty cheap insurance. I have found that foundation work and site work are very incremental. It does sometimes feel like you are getting nowhere quickly! However, this all changed pretty quickly yesterday morning. With all necessary site work completed we were able to start backfilling a day early, and to see that happen was pretty exciting. 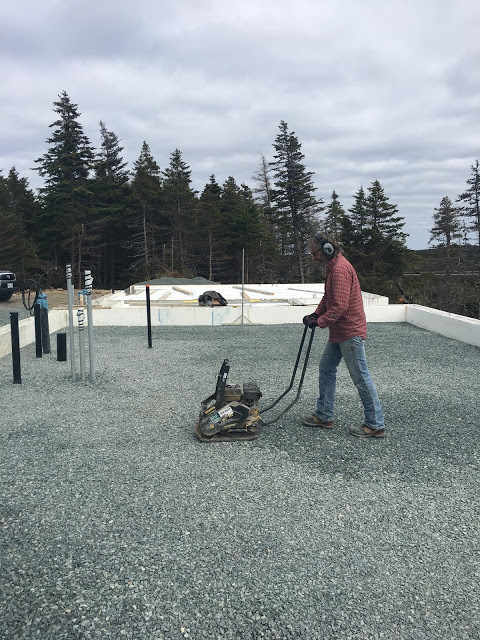 Starting tomorrow, the infill inside the frost walls will be tamped with a large diesel tamper to help compact the stone for the structural slab. 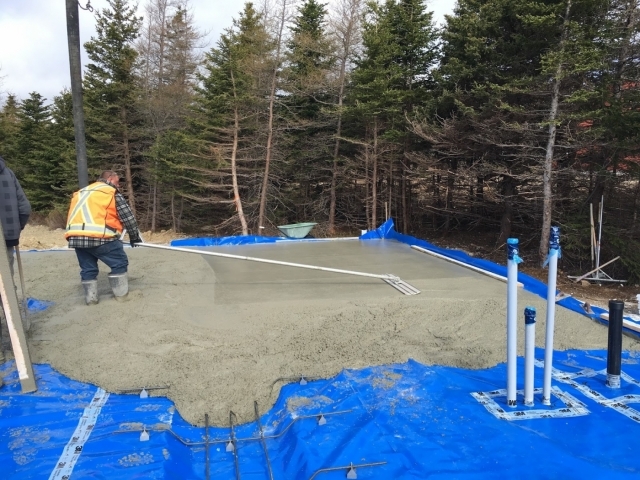 After backfilling and infilling the the frost wall foundation, we tamped the fill material in hopes that it would reduce settling and therefore cracks in the slab over time. These compactors are quite effective. Material which would seem to be solid starts to collapse as the compactor moves over the ground. Prepping for the slab insulation was fairly simple. Our slab will be poured to a thickness of about 4 inches and the insulation is 10 inches of Type II EPS foam. We snapped a chalk line on the interior insulation, 14 inches below the top of the foundation, to use as a guide for filling the foundation with 3/4-inch crushed stone. Slugging stone by hand is slow and heavy work. We hired Weir’s Construction to do most of it with a stone slinger. Holes through 10 inches of slab insulation for conduit didn’t have to be exact; gaps between the conduit and the foam could be sealed with foam. While the slinger operator was able to distribute the stone fairly evenly, we still had to spend some time making sure the surface was level. We strung a series of lines across the foundation from side to side. Using shovels and a landscaping rake, we leveled the stone under the lines to match the height at the edge of the foundation. As we compacted the stone, we raked out high spots and added stone to low spots, checking the depth as we went. After compacting, it was on to foam. 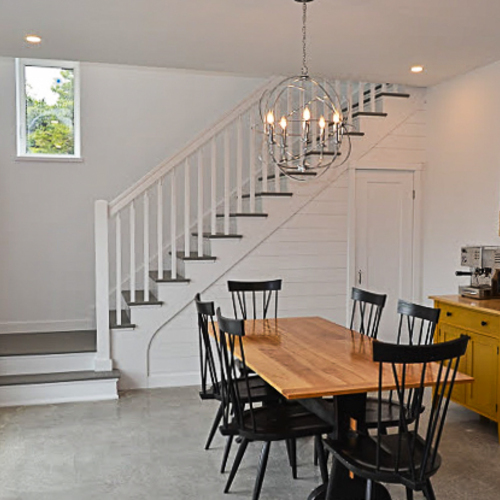 The slab has one load-bearing wall, which supports the second floor but not the roof. To keep things simple we added a thickened slab under that wall, which will be reinforced with rebar. 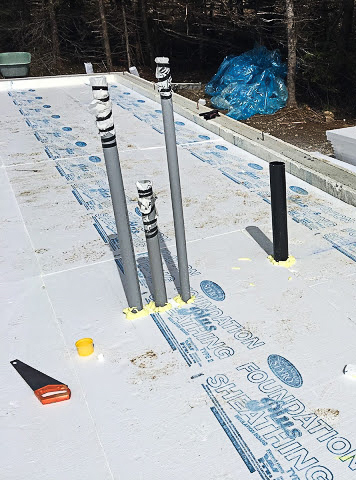 Under that “footing” is 6 inches of Type III EPS which has a higher compressive strength than the Type II EPS used on the foundation and under the remainder of the slab. Cutting around the through-slab penetrations in the EPS is a time-consuming task. I found the quickest way was to mark the position of a hole on the sheet and use a 1/2-inch spade bit to drill a series of holes through the foam at regular intervals, then use my fist to punch out the center. I figured it’s going to be filled with spray foam anyway, so it doesn’t have to be really neat. It just has to fit around the pipe. and spray foam will do the rest (see Image #7 below). After the first 4-inch layer of insulation was complete, we moved on to laying the next 2-inch layer in the same manner. Once it came time to cut holes and fit pieces, one person did the cutting and another person moved on to laying more 4-inch foam. It was such a beautiful day that we decided to keep working. We didn’t quit until 8:45 p.m. The forecast was showing two good days on June 8 and 9. I was told that to be safe, we really needed 36 hours. 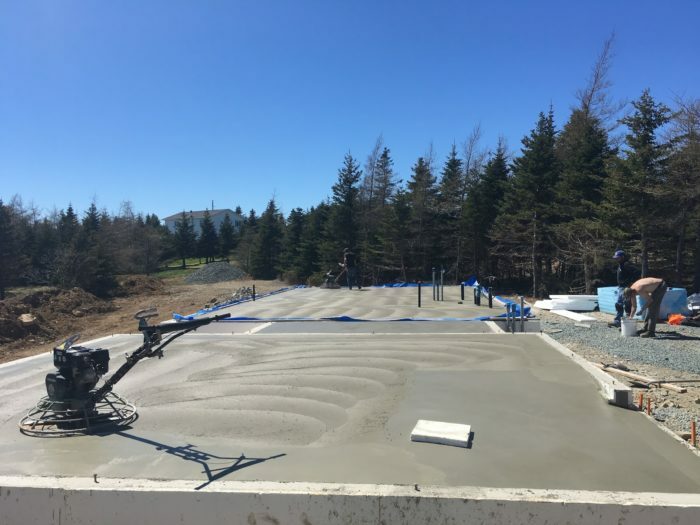 This would provide time to pour, wait for the slab to be finished and have another 24 hours for it to really set up hard before bad weather. In advance, we had a lot of work to do: lay the vapor barrier, seal all overlaps and penetrations, and lay rebar for the thickened load bearing slab. We chose a 15-mil polyolefin vapor barrier from Raven Industries, available in 12-by-200-foot sheets. Local code required an approved polyethylene vapor barrier tape. Most builders use a blue Tuck Tape. Personally, I have found this tape is brittle, and although it works well for Tyvek housewrap, it doesn’t stand up well to the abuse it would get before the concrete pour. Instead, I opted to use 3M 8067. It’s tenacious, it stretches, and it’s thick (5 mils). The manufacturer’s specifications say it can be used in this application, and the split back makes it easy to work with. We did find it was easier to apply the tape as a two-person team. One person pulled the paper backing off while another applied pressure and made sure that the tape stuck flat on the vapor barrier. It’s useful to keep an eye on what’s ahead of you. If the tape starts to wander, it can be stretched slowly in another direction and brought back straight along the course of the seam. After the seam was taped, we inspected it corrected any areas that looked suspicious with a small bead of acoustical sealant followed by a flat patch of 3M 8067. To seal around pipe and conduit penetrations, Raven Industries makes a boot. It wasn’t available locally, but creating our own pipe boots on site with scraps of vapor barrier was not that difficult. We sealed them with a bead of acoustical sealant and 3M tape. With the 15-mil polyolefin vapor barrier in place (and taped), the concrete slab could be poured. The trench in the middle of the photo, where the rebar is visible, will provide additional support for a structural wall. The porch is an unheated space and the garage will be occasionally heated, so air sealing the slab wasn’t really that big of a concern. I just followed the designer’s recommendations: Lay the vapor barrier out flat and pour over it. To avoid using my expensive 3M 8067 tape, we opted for the cheaper Tuck Tape for this application. This was all completed just in time. The pump truck was on site one hour early! The truck was quickly followed by four guys from East Coast Concrete Finishing, along with the concrete truck. They set up a laser level and did a quick grade measurement to ensure the slab would be level. I did one last survey of the vapor barrier to inspect for holes, and with a thumbs up, the pour started. If you ever get a chance to watch a slab pour, it’s worth your time to hang around and watch how a team of people work collectively to level and float a slab. There is very little talking back and forth. They all seem to behave as a collective: Each one knowing what the other is doing, working closely in unison. As they were working along the edges, I would pull the vapor barrier tight and work it into the corner of the slab, trying to keep it as flat as possible. I have often seen people cut a slit in the vapor barrier at the corners to get it to fold down. Every time I have seen this detail I cringe. There is almost no way to air seal it. To avoid a difficult air sealing detail, I opted to do a kind of folded inside corner that looked kind of the reverse of wrapping the corner of a gift box with wrapping paper. In about an hour the pour was completed. Watching a pour like this is pretty satisfying. You get to see how all of your hard work pays off. Now we have a foundation (see Image #9 below). Time to start planning for the next stage: Framing!